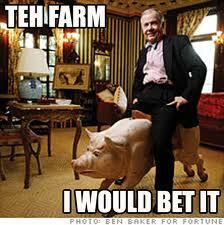 Writing about commodities market you can’t ignore the always charming commodities guru Jim Rogers. He started on Wall Street back in the 60s and went on to co-found the Quantum Fund with George Soros. Then he packed up and moved to Singapore, essentially shorting the west. He is heavily invested in agriculture / gold and silver and training his children to speak Mandarin as he thinks balance of power shifting to Asia.